Many of us nurse a secret fear that we’re frauds. We furtively suspect that someday, someone will swoop into town, inform our employers, loved ones, and relatives of that fact, and we’ll be exiled to a purgatory with the other lost souls caught masquerading as productive, worthwhile human beings. For many of us this fear is abstract. It’s the nagging voice in the back of our heads at the end of a long, hard day. It's the insecurity that refuses to go away. For people who write online, this voice often takes on an external form, in the shape of commenters telling us we're frauds and should be exiled to the land of wind and ghosts with the rest of us facile pretenders. In “Burns Verkaufen der Kraftwerk,” the voice that tells Homer he's not good enough and doesn’t deserve deserve his place in society comes from an external place as well. When a German business purchases the Springfield Power Plant, the free ride Homer has been enjoying since birth appears to be up, since its downsizing roster consists of a single soul: Homer. He, alone among, the employees of the Springfield Power Plant does not deserve to hold onto his job, even under bosses as kindly and generous as the Germans. Ah, but we are getting ahead of ourselves. Before the plant can be sold, Mr. Burns first needs to grow bored of it. The scenes of Mr. Burns talking to Smithers and his little friend Sparky the Alligator about his existential ennui have a pleasingly melancholy air. So do the sequences of Mr. Burns in retirement trying, and failing, to behave like a human being. Without power and drive, Burns is a movingly vulnerable figure. Burns' incredible physical weakness lends a tragic air to his financial and political power, so it’s always bittersweet seeing him puttering around bee-keeping and boxing and doing whatever it is he thinks he should be doing other than striking fear in the hearts of his employees. That’s his true existential identity, not being a gentleman of leisure. In “Burns Verkaufen der Kraftwerk,” rumors that Burns will be selling the Springfield Power Plant send the company’s stock rocketing skyward, making everyone rich but Homer, who foolishly sold all of his stock when it hit twenty five dollars. Phil Hartman provides the voice of Homer’s stockbroker, a grey, cigar-smoking man dying a slow, sad death under the sickly fluorescent lights of an office that appears to be on the same floor of the damned as the building where much of Being John Malkovich takes place. Homer's stockbroker, whom we'd regrettably never see again, is a man out of time, a figure of the damned brought to cantankerous life by Hartman’s exquisitely defeated rasp. The stockbroker lingers under the misconception that he’s legally or at least morally obligated to make a little small talk with his clients before getting down to business, so he asks Homer the basics: Ever go dancing? Like sports? Everyone still alive? In the audio commentary the writers say that James L. Brooks pitched the concept of an ancient, dust-covered stockbroker Homer never sees. That makes sense because it’s a very old school comic conceit I could see working in vaudeville or on a smart sitcom in the 1960s. “Burns Verkaufen der Kraftwerk” pushes Homer and Mr. Burns outside their natural habitats of the power plant and into a scary outside world where they can’t really function. In the key line in the episode, a devastated Burns tells Smithers, “Good heavens. They don’t fear me anymore. What good is money if it can’t inspire terror in your fellow man?” That’s the nagging central question to Burns’ existence and the reason he can never sell the power plant or let it go. Without it, he's nothing, an empty shell. After the Germans take over, there is a pleasingly wild sense that the rules have been abandoned and anything can happen. Bart can stick it to Mr. Burns without fear of reprisal, and Bart delights the drunks down at Moe's with a spirited performance of “Teddy Bear’s Picnic.” I loved how anachronistic the sequence felt. I wished we still lived in a world where chipper little boys delighted sad men in bars with zippy little ditties. 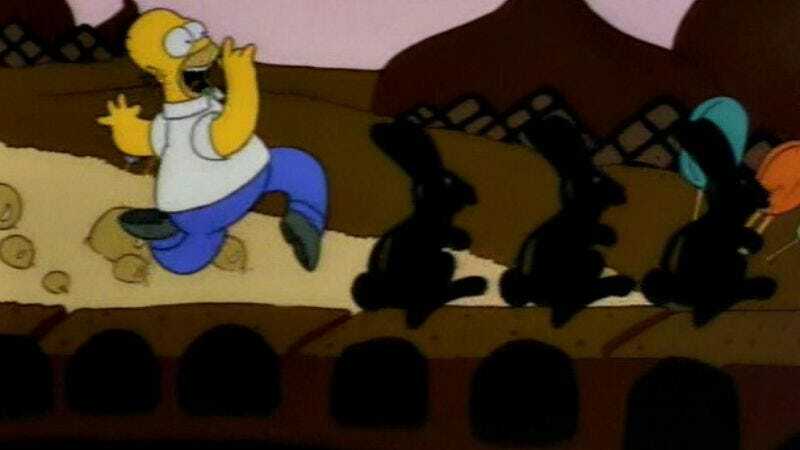 The “Teddy Bear's Picnic” sequence is a crowd-pleaser, but it would be hard to imagine a sequence in the show’s fabled history that radiates more pure joy than the fantasy sequence of Homer skipping madly about the Land of Chocolate after learning of its existence from his new Teutonic overlords. I want to live in that world for eternity. For all his faults, Homer radiates an infectious sense of joy about the things he loves that's very winning. He holds nothing back, even when he should. Homer has been fired from his job by emissaries from the magical Land of Chocolate. 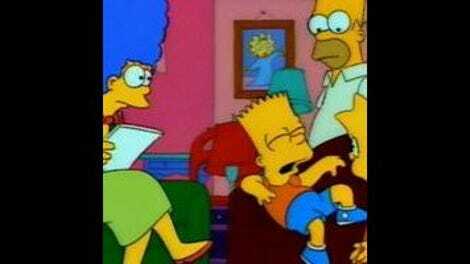 Moe is delighted with Bart. Mr. Burns wanders the streets, powerless. The world has gone mad. That’s what happens in sitcoms immediately before things go back to normal. The Springfield Power Plant needs Mr. Burns just as much as Mr. Burns needs it. Homer and Mr. Burns and the Springfield Power Plant all need each other. They’re all locked in a complicated cycle of inter- and co-dependence. So the episode ends as it must: with Mr. Burns giving Homer his job back so that he can lull Homer into a false sense of confidence, then destroy him when he’s most vulnerable. That is perpetually Burns’ plan for Homer, but he never quite gets around to destroying him, for reasons this episode makes abundantly clear. "I renew my notary license on a weekly basis." "In exchange for waving certain constitutional rights." "This is a place of business, not a Pee-Wee Flophouse"